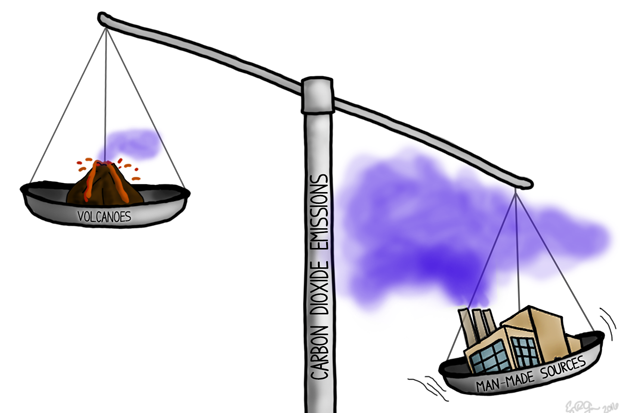 Which emits more carbon dioxide: volcanoes or human activities? Human activities emit 60 or more times the amount of carbon dioxide released by volcanoes each year. Large, violent eruptions may match the rate of human emissions for the few hours that they last, but they are too rare and fleeting to rival humanity’s annual emissions. In fact, several individual U.S. states emit more carbon dioxide in a year than all the volcanoes on the planet combined do. On the scale of carbon dioxide emissions, human sources far outweigh volcanoes. NOAA Climate.gov cartoon by Emily Greenhalgh. Human activities—mostly burning of coal and other fossil fuels, but also cement production, deforestation and other landscape changes—emitted roughly 40 billion metric tons of carbon dioxide in 2015. Since the start of the Industrial Revolution, more than 2,000 billion metric tons of carbon dioxide have been added to the atmosphere by human activities according to the Global Carbon Project. Since the start of the Industrial Revolution, human emissions of carbon dioxide from fossil fuels and cement production (green line) have risen to more than 35 billion metric tons per year, while volcanoes (purple line) produce less than 1 billion metric tons annually. NOAA Climate.gov graph, based on data from the Carbon Dioxide Information Analysis Center (CDIAC) at the DOE's Oak Ridge National Laboratory and Burton et al., 2013. Volcanoes emit carbon dioxide in two ways: during eruptions and through underground magma. Carbon dioxide from underground magma is released through vents, porous rocks and soils, and water that feeds volcanic lakes and hot springs. Estimates of global carbon dioxide emissions from volcanoes have to take both erupted and non-erupted sources into account. Much of the carbon dioxide released by volcanoes is emitted by degassing of subterranean magma when the volcano is not erupting. 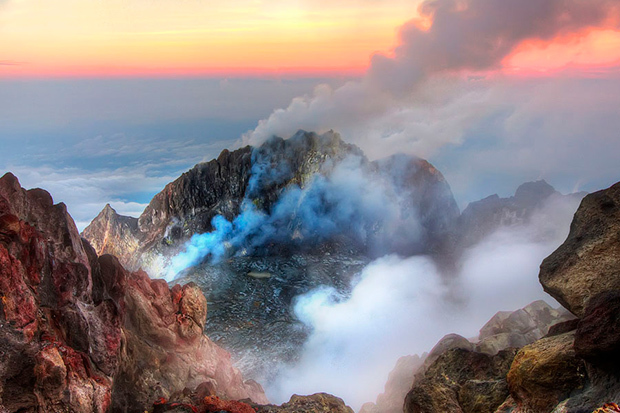 In this photo, volcanic gases and steam rise from Mount Merapi, Indonesia, on May 20, 2012. Creative Commons license by Jimmy McIntyre. In a 2011 peer-reviewed paper, U.S. Geologic Survey scientist Terry Gerlach summarized five previous estimates of global volcanic carbon dioxide emission rates that had been published between 1991 and 1998. Those estimates incorporated studies reaching back to the 1970s, and they were based on a wide variety of measurements, such as direct sampling and satellite remote sensing. The global estimates fell within a range of about 0.3 ± 0.15 billion metric tons of carbon dioxide per year, implying that human carbon dioxide emissions were more than 90 times greater than global volcanic carbon dioxide emissions. 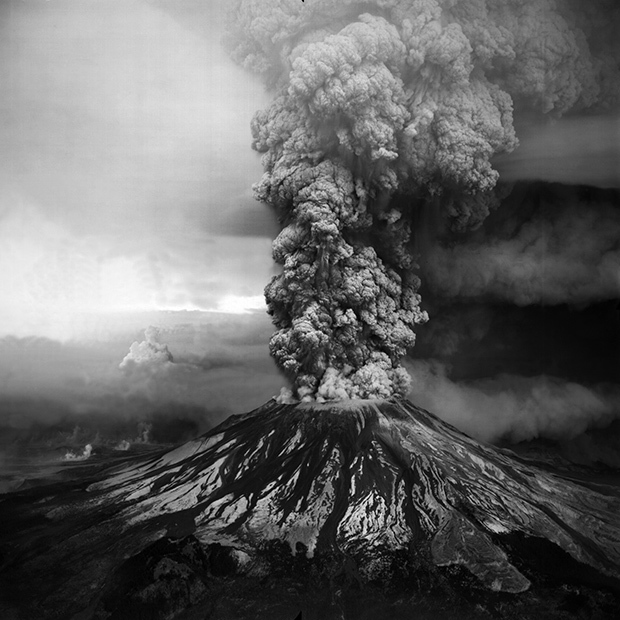 On May 18, 1980, Mount Saint Helens experienced an explosive eruption, sending a column of ash, steam, and gases up to 60,000 feet above sea level. For about nine hours, carbon dioxide emissions from the volcano may have matched human emissions, but such massive eruptions are rare and fleeting. U.S. Geological Survey photo by Robert Krimmel. In 2013, another group of scientists—Michael Burton, Georgina Sawyer, and Domenico Granieri—published an updated estimate using more data on carbon dioxide emissions from subsurface magma that had become available in the years since the last global estimate. While acknowledging a large range of variability in the estimates, the authors concluded that the best overall estimate was about 0.6 billion metric tons of carbon dioxide per year. Occasionally, eruptions are powerful enough to release carbon dioxide at a rate that matches or even exceeds the global rate of human emissions for a few hours. For example, Gerlach estimated that the eruptions of Mount St. Helens (1980) and Pinatubo (1991) both released carbon dioxide on a scale similar to human output for about nine hours. Human emissions of carbon dioxide continue day after day, month after month, year after year. Volcanic activity today may pale in comparison to the carbon dioxide emissions we are generating by burning fossil fuels for energy, but over the course of geologic time, volcanoes have occasionally contributed to global warming by producing significant amounts of carbon dioxide and other greenhouse gases. For example, some geologists hypothesize that 250 million years ago, an extensive flood of lava poured continually from the ground in Siberia perhaps hundreds of thousands of years. This large-scale, long-lasting eruption likely raised global temperatures enough to cause one of the worst extinction events in our planet's history. Current volcanic activity doesn't occur on the same massive scale. Today, rather than warming global climate, volcanic eruptions often have the opposite effect. That's because carbon dioxide isn't the only thing that volcanoes inject into the atmosphere. Even small eruptions often produce volcanic ash and aerosol particles. 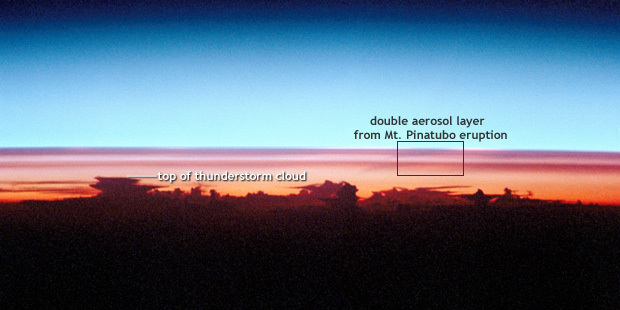 Taken by astronauts from the Space Shuttle in early August 1991, this photo of the Earth's limb shows the double layer of volcanic aerosol particles (interpretation from Self et al., 1999) that spread through the stratosphere following the catastrophic eruption of Mt. Pinatubo. Encircling the globe at altitudes even higher than the tops of thunderstorm clouds, the particles reflected so much incoming sunlight that global surface temperatures cooled off for two years. Photo courtesy NASA JSC's Gateway to Astronaut Photography of the Earth. Whether from small or large eruptions, volcanic aerosols reflect sunlight back into space, cooling global climate. The 1815 eruption of Mount Tambora produced enough ash and aerosols to cancel summer in Europe and North America in 1816. Boden, T.A., Marland, G., Andres, R.J. (2015). Global, Regional, and National Fossil-Fuel CO2 Emissions, Carbon Dioxide Information Analysis Center, Oak Ridge National Laboratory, U.S. Department of Energy, Oak Ridge, Tenn., U.S.A.
Cook, J. (2015). Do volcanoes emit more CO2 than humans? Skeptical Science. Accessed May 11, 2016. Gerlach, T. (2011). Volcanic versus anthropogenic carbon dioxide. EOS, 92(24), 201–202. Hawaiian Volcano Observatory. (2007, February 20). Which produces more CO2, volcanic or human activity? U.S. Geological Survey. Accessed May 11, 2016. Houghton, R.A., van der Werf, G.R., DeFries, R.S., Hansen, M.C., House, J.I., Le Quéré, C., Pongratz, J., Ramankutty, N. (2012). Chapter G2 Carbon emissions from land use and land-cover change, Biogeosciences, 9, 5125-514. IPCC. (2014). Summary for Policymakers. In: Climate Change 2014: Mitigation of Climate Change. Contribution of Working Group III to the Fifth Assessment Report of the Intergovernmental Panel on Climate Change [Edenhofer, O., R. Pichs-Madruga, Y. Sokona, E. Farahani, S. Kadner, K. Seyboth, A. Adler, I. Baum, S. Brunner, P. Eickemeier, B. Kriemann, J. Savolainen, S. Schlömer, C. von Stechow, T. Zwickel and J.C. Minx (eds.)]. Cambridge University Press, Cambridge, United Kingdom and New York, NY, USA. Le Quéré, et al. (2015). Global Carbon Budget 2015, Earth Syst. Sci. Data, 7, 349–396, doi:10.5194/essd-7-349-2015, 2015. Oskin, B. (2013, December 12). Earth's Greatest Killer Finally Caught. LiveScience. Ridley, D. A., Solomon, S., Barnes, J. E., Burlakov, V. D. (2015). Total volcanic stratospheric aerosol optical depths and implications for global climate change. Geophysical Research Letters, 41, 7763–7769. Self, S., Zhao, J-X., Holasek, R., Torres, R., and King, A. (1999). The Atmospheric Impact of the 1991 Mount Pinatubo Eruption. [Online] U.S. Geological Survey Website. http://pubs.usgs.gov/pinatubo/self/ Accessed June 16, 2016. University Corporation for Atmospheric Research. (2012). Mount Tambora and the Year Without a Summer. Accessed May 11, 2016. Understanding Evolution. Volcanic activity and mass extinction. Accessed May 12, 2016. U.S. Energy Information Administration. Total Energy. Accessed May 11, 2016.